Wait a second, your makeup expires? When you pick up your holy grail eyeliner that’s only used for special occasions, you may be endangering your health. Cosmetics have expiration dates, usually on the back of the packaging (the date only applies for when you open the product, however, so an unopened product in a store is okay). Cosmetics expire for a number of reasons. According to the Food and Drug Administration, used cosmetics are a breeding ground for microorganisms like bacteria and fungi. This can cause products to change pigment and texture, smell or dry out. High-end makeup can be used for a little longer than drugstore products due to the premium technologies and ingredients that involve in their creation. Drugstore products usually contain more synthetic materials. However, most products still have a similar range in shelf lives. Eye products are the first to go as the eyes are more susceptible to infections. Most eyeshadow palettes expire within 18 months, though Cosmetic Calculator says they may be able to last up to three years. Mascara wands are the most susceptible product to microorganisms because it is so often exposed to air. Using your fingers, the FDA says, to apply a product may also increase the chances of it expiring. Manufacturers usually recommend that mascara should be thrown out once it dries out or within four months. Liquid products, like foundation and concealer, expire within a year. Byrdie says this is due to the formula sometimes separating, causing the product to get watery or oily. Liquid liner is similar to mascara—four months tops. Lip products last up to a year. It’s easy for them to melt or dry out, so try to store them in your bedroom. Lip pencils and eyeliner also have a shelf life of one year, according to Byrdie. These products get close to sensitive areas, so you definitely want to keep an eye out for them. 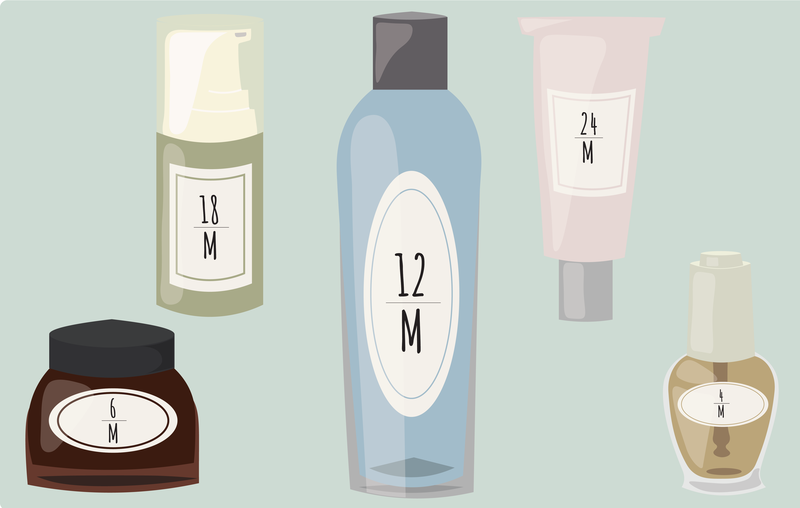 But what actually is the harm in using cosmetics past their expiration date? Most often, your products will stop living up to expectations, and it’s always a disappointment when your eyeshadow palette doesn’t perform. In some cases, expired cosmetics cause uncomfortable side effects that may inhibit your ability to apply any makeup at all. Expired makeup may cause acne breakouts and skin rashes. The built-up bacteria seeps into your pores and may also cause redness or oiliness, according to HealthyWay. HealthyWay says bacteria also travels onto your lashes and waterline whenever you use an expired mascara tube, causing eye infections, which are never fun. It’s safer to just follow the rules. In order to make your makeup last a little longer, the FDA recommends storing cosmetics in a cool, dry area (so definitely not your hot car or in the bathroom, where moisture lives) and keeping brushes and other applicators clean. Another rule the FDA says to always follow is to never share makeup. Your friend’s germs can quickly be passed to you, or vice versa. It goes without saying that tester products at the store are off-limits unless there is a clean disposable applicator nearby. While the saying goes “pain is beauty,” no beauty is worth nasty eye infections and breakouts. Take a look through your makeup collection and doing a little cleanout. You might have just saved yourself from a future bad beauty day.